While China’s oil dealings with countries like Iran and Sudan receive global attention, its budding relationship with Iraq may turn out to be the most important. A lot of attention has been paid in recent years to energy-hungry China’s billion-dollar bids on oil fields in Canada and the Asian giant’s reliance on oil from countries like Iran and Sudan to fuel its growing economy. But its growing interest in another major oil producer has gone largely unnoticed, and if current trends continue, that Middle Eastern country could become the world’s next “oil superpower,” with China, not the West, acting as both Iraq’s main partner and top beneficiary of its rich resources in what some now call the B&B trade axis (Beijing and Baghdad). In the past decade or so, China waited patiently on the sidelines while the U.S. and its allies coped with Iraq’s new, and often times messy internal dynamics that followed the 2003 overthrow of Saddam Hussein by a U.S.-led coalition. 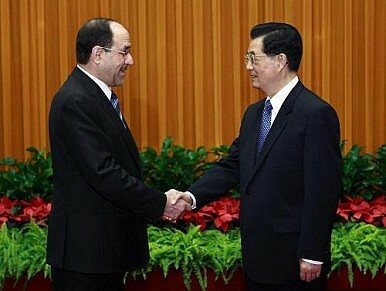 China reemerged in 2008, however, to sign post-Saddam Iraq’s first major oil deal with a foreign country. While the majority of Iraqi oil deals in the post-Saddam era were awarded to Western firms, the Western shift to a more amenable and independent oil-rich Kurdish region in the north amid disenchantment with southern Iraq is creating a vacuum that China has found hard to resist. Even more so than Russia, a traditional player in Iraq during the Soviet era, China has the capital that Baghdad is desperately seeking to build its oil and gas infrastructure, while Iraq has crude potentials that are alluring to a China that seeks to diversify its energy sources. Already, Chinese oil firms have taken an active interest in acquiring deals that had been awarded to Western firms in 2009-2010, which the latter are now relinquishing so they can focus on alternative oil fields in Kurdistan. Although talks between China and Iraq go back to at least 1997, major investments have only occurred in recent years, with Chinese National Petroleum Company (CNPC) focusing on the 17 billion barrel Rumaila field — Iraq’s largest — and Halfaya, both in the south. As of 2010, China had made five major oil investments in Iraq since the overthrow of Saddam Hussein, one of which was in Kurdistan. Relations are already on the right foot. To create goodwill with Baghdad, Beijing in 2010 forgave about 80 percent of Iraq’s $8.5 billion debt to China and has signed multibillion-dollar trade deals in various sectors, including industry, government, tourism, and transportation. As China seeks to expand its fledging defense industry, it is not unreasonable to think that at some point Iraq will turn to it for military hardware, which in turn would create incentives for greater military cooperation between the countries and further entrench China’s presence in Iraq. Bangladesh: Asia's New Energy Superpower?China and Iraq Expand Energy and Defense TiesChina Doubles Down on Iraqi Oil GambleWestern Australia’s Energy Boom: Built to Last?India's African "Safari"